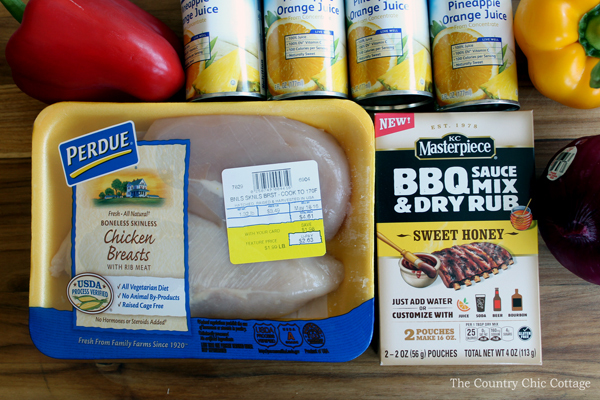 Sweet honey chicken kabobs will be your new go to recipe for summer grilling season. This super simple recipe can be made any day of the week for a delicious main dish that the entire family will love. When KC Masterpiece® asked to sponsor a post, I knew I wanted to do a different spin on a grilled dish. Plus everyone loves food on a stick y’all. 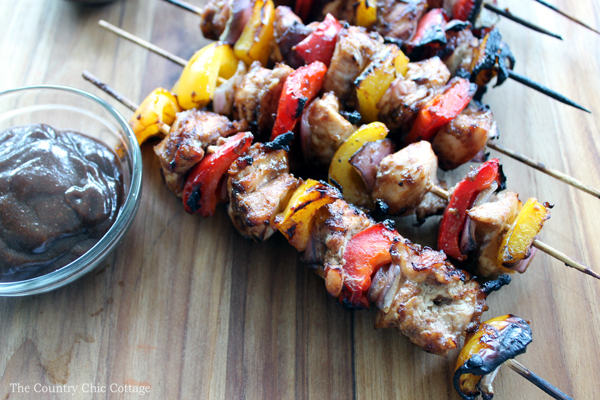 So these sweet honey chicken kabobs were the perfect dish to share. 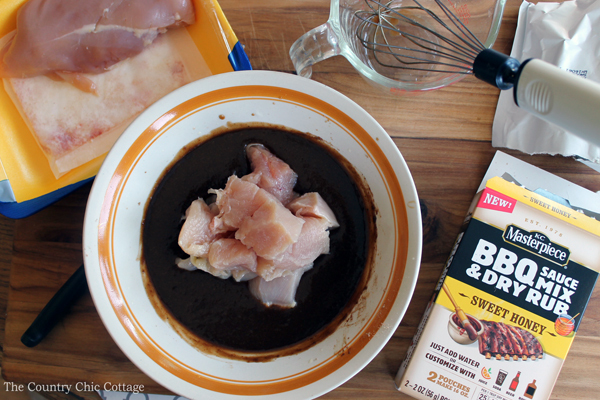 Once you have mixed the marinade, add in your chicken cut into bit sized pieces. Toss to mix and place in the refrigerator for at least 30 minutes. In the meantime, soak your bamboo skewer sticks in water to get them ready for the grill. Once your chicken is done marinating, fire up your charcoal grill and start assembling your kabobs. I placed pepper, onion, and chicken on the skewer then repeated those layers as shown below. Then grill your skewers over charcoal until the chicken is completely done. 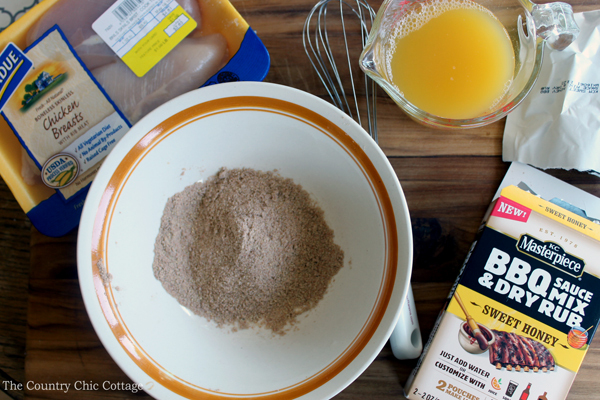 Mix another pouch of the KC Masterpiece BBQ Sauce Mix & Dry Rub Sweet Honey with 3/4 cup of pineapple orange juice for a sweet dipping BBQ sauce that can be served on the side. 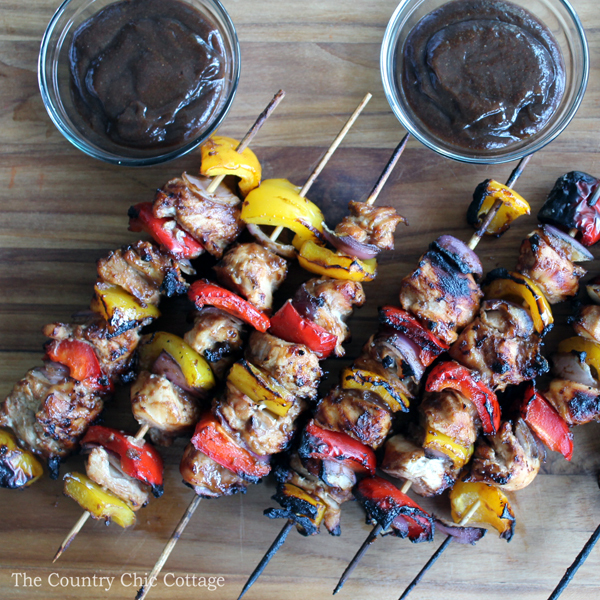 These sweet honey chicken kabobs are ready for serving up for supper! Try any of the three varieties of KC Masterpiece BBQ Sauce Mix & Dry Rub. They can be mixed with 3/4 – 1 cup of water, soda, beer, bourbon, or juice. They make it so easy to create a dish that is all your own this summer! Break out the grill and make these sweet honey chicken kabobs or any other recipe you can dream up! The KC Masterpiece BBQ Sauce Mix & Dry Rub makes it so easy! 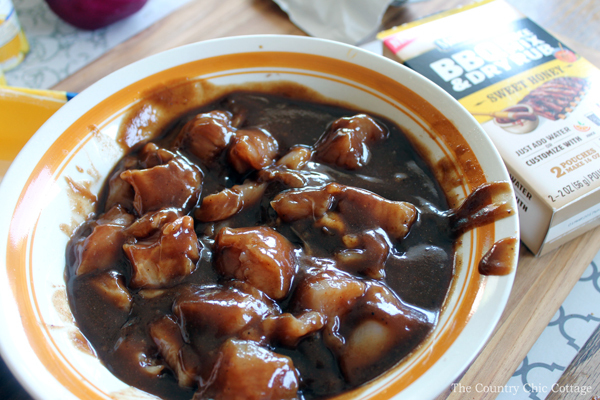 Love this recipe and want to print it? Just click the recipe card below! Let marinate for at least 30 minutes. 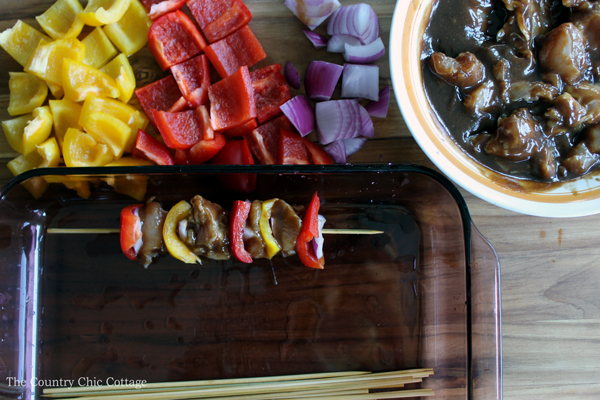 Soak your bamboo skewer sticks in water to get them ready for the grill. Once your chicken is done marinating, fire up your charcoal grill and start assembling your kabobs. Grill your skewers over charcoal until the chicken is completely done. That looks great, I had no idea that KC Masterpiece had rubs…will have to check this out! Thanks for the recipe! Stopping by from Mad Skills Party. oh these sweet honey chicken kabobs look so scrumptious!! We will have to try these next weekend! nom 🙂 We love kc masterpiece so any recipe that includes that has to be good! thanks for sharing! Yummy in my tummy! I’m so glad the rain stopped so I can get back to grilling. I need to try these kabobs! Stopping by from SITS Blogging and hope you linkup with us again at Small Victories Sunday LInkup this weekend! 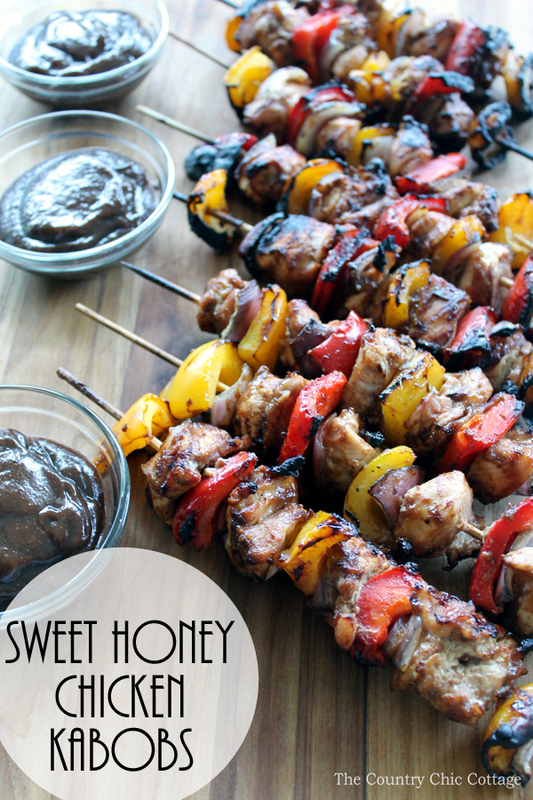 I can’t wait to try your Sweet Honey Chicken Kabobs, this is a great recipe! Thanks so much for sharing with Full Plate Thursday and have a great weekend! Those look amazing! Definitely going to keep my eye out for that great dry rub! Thanks for joining the DI & DI Link Party. Have a great week!